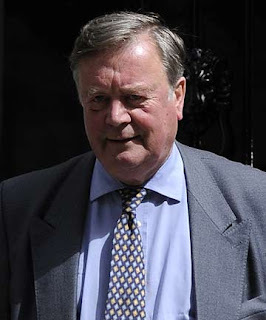 IN THE CLEAR: Britain's Justice Secretary Kenneth Clarke. An individual who stabs a burglar while defending themselves, or their property will not face prosecution, Kenneth Clarke, Britain's Justice Secretary, has said, promising any lingering doubts over the controversial issue will be clarified in a new law. "If an old lady finds she has got an 18-year-old burglar in her house and she picks up a kitchen knife and sticks it in him, she has not committed a criminal offence," he said in a BBC interview. Clarke was reacting to the high-profile case of a suspected burglar who was stabbed to death during a break-in at a house in Salford last week. The victim was one of a gang of four men, some wearing balaclavas. The householder was arrested on suspicion of murder and has been released on police bail pending further inquiries. Clarke said new legislation being prepared by the government would make it "absolutely clear" that individuals were allowed to use "reasonable force to defend ourselves to protect our homes, or both." He said the law needed urgent clarification to make sure no one who took those steps will be prosecuted or convicted in future. Under the 2008 Criminal Justice Act homeowners in England can use "reasonable force" to protect themselves against intruders without fear of prosecution, but Clarke said there had been "constant doubt" over issue and its interpretation by the courts which had to be removed. "We will make it quite clear you can hit the burglar with a poker if he is in the house and (that) you have a perfect defence if you do so, and given the doubts that have been expressed, we are going to clarify that," he said. However, Clarke said ordinary members of the public will not be able to take the law into their own hands. "What they are not entitled to do is go running down the road chasing them or to shoot them in the back ... or to get their friends together to beat them up." Prime Minister David Cameron said last week the government would put the thorny issue of self-defence for homeowners and shopkeepers "beyond doubt."